It looks like short links are here to stay, at least for a while longer. Bit.ly, the largest independent link shortening service out there, closed a $9 million Series B financing. (Correction: An earlier version of this story had $10 Million as the amount raised. The actual amount was $8.9 million). The round was led by RRE Ventures, with AOL Ventures also becoming a new investor. Existing investors betaworks, O’Reilly Alpha Tech Ventures, SV Angel, Founders Fund, and a few angels participated as well. Every day, more than 200 million bit.ly short links are clicked on and decoded by the link-shortening service. Bit.ly keeps growing despite no longer being the default link shortener for Twitter. 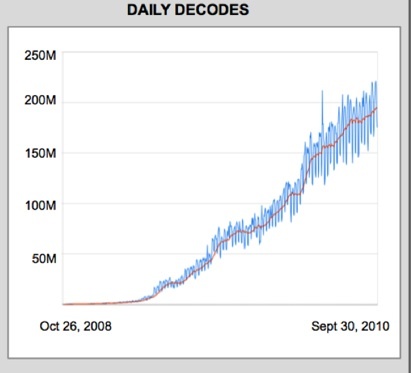 In September, nearly 6 billion bit.ly links were clicked (or decoded), up from 3.4 billion six months earlier. Twitter now only represents about a third of bit.ly’s links, down from about 60 percent last December when it stopped being the default link shortener for Twitte (which now uses its own link shortener). Facebook, MySpace, and new services such as Formspring are more than picking up the slack. Bit.ly has been able to scale up to this point with only $5 million in capital invested. It now has 17 employees. It’s first source of revenues comes from Bit.ly Pro accounts, which are used by 3,000 companies and another individual 1,000 power users. (TechCrunch uses Bit.ly Pro to shorten all of our blog post links we distribute through Twitter). And while there was a recent controversy over Libya shutting down some .ly sites, the issue doesn’t seem to be spilling over to bit.ly. But the bigger opportunity for bit.ly is in all the data it is harvesting about which links people are sharing in realtime. Before the end of the year, in partnership with the New York Times, it will launch News.me, a project which began in the R&D Labs of the New York Times. That team is now working temporarily at bit.ly and using its underlying data to build a social news product which has yet to be unveiled. It will be a showcase for the kinds of news and information products which can be built on top of bit’ly’s data (see the never-launched Bit.ly Now). If you think about it, bit.ly knows what news is breaking because everybody is sharing it. On sites which it helps to operate like News.me, bit’ly will make traditional advertising revenue. But as more media and commerce sites start building their own products on top of bit.ly’s data, it becomes more of a pure data business where it could charge by the amount of data consumed. And to the extent that bit.ly can figure out people’s intent based on their realtime sharing patterns, it could create relevant, topical ad units which themselves get inserted into the realtime stream in the form of Tweets, status updates or whatnot. A lot of that still has to be figured out, but the $10 million bit.ly just got should give it more time to experiment.